Luteinizing hormone (LH) and follicle-stimulating hormone (FSH) are called gonadotropins because they stimulate the gonads – in males, the testes, and in females, the ovaries. They are not necessary for life, but are essential for reproduction. These two hormones are secreted from cells in the anterior pituitary called gonadotrophs. Most gonadotrophs secrete only LH or FSH, but some appear to secrete both hormones. As described for thyroid-simulating hormone, LH and FSH are large glycoproteins composed of alpha and beta subunits. The alpha subunit is identical in all three of these anterior pituitary hormones, while the beta subunit is unique and endows each hormone with the ability to bind its own receptor. As its name implies, FSH stimulates the maturation of ovarian follicles. Administration of FSH to humans and animals induces “superovulation”, or development of more than the usual number of mature follicles and hence, an increased number of mature gametes. The principle regulator of LH and FSH secretion is gonadotropin-releasing hormone(GnRH, also known as LH-releasing hormone). GnRH is a ten amino acid peptide that is synthesized and secreted from hypothalamic neurons and binds to receptors on gonadotrophs. Numerous hormones influence GnRH secretion, and positive and negative control over GnRH and gonadotropin secretion is actually considerably more complex than depicted in the figure. 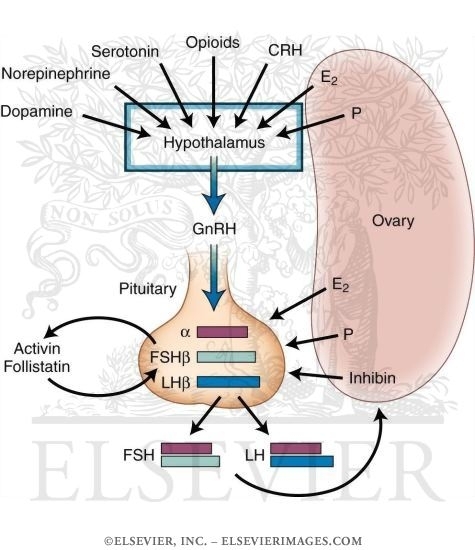 For example, the gonads secrete at least two additional hormones – inhibin and activin – which selectively inhibit and activate FSH secretion from the pituitary. Medical illustration of oxygen free radicals. After blood flow is restored to injured cells and tissues, the damaged cells produce oxygen free radicals, molecules that begin a process called lipid peroxidation, destroying cells around an injury. Here, the cell membrane lipid bilayer (blue) is being damaged by oxygen free radicals (red and white clusters). For years, scientists have sought a way to boost one of the body’s most powerful natural antioxidant enzymes: superoxide dismutase (SOD). Present both inside and outside cell membranes, SOD is one of the body’s primary internal anti-oxidant defenses, and plays a critical role in reducing the oxidative stress implicated in atherosclerosis and other life-threatening diseases. Studies have shown that SOD can play a critical role in reducing internal inflammation and lessening pain associated with conditions such as arthritis. Until recently, attempts to supplement with oral preparations of pure SOD enzyme proved disappointing, since the SOD protein molecule is easily deactivated by harsh acids and enzymes contained in the digestive tract.1,2 Scientists have conquered these challenges by creating bioavailable forms of SOD using natural plant extracts. When delicate SOD molecules are coupled with a protective protein derived from wheat and other plants, they can be delivered intact to the intestines and absorbed into the bloodstream, thus effectively enhancing the body’s own primary defense system.2-5 Once in circulation in the bloodstream, these powerful antioxidants go to work detoxifying potentially harmful substances and reducing oxidative stress that might otherwise contribute to aging and crippling diseases such as atherosclerosis, stroke, and arthritis. By strengthening the body’s primary antioxidant systems, novel SOD-boosting supplements may offer the most powerful free radical protection available today. The antioxidant enzymes produced within our bodies are complex proteins that often incorporate minerals such as selenium or zinc in their intricate structures. These antioxidant enzymes serve as the body’s most potent defense against free radicals and ensuing inflam-matory reactions. They include glutathione peroxidase, catalase, and perhaps the most important internally generated antioxidant of all: superoxide dismutase (SOD). Some of the most potentially harmful substances in the body are not toxins that enter from the external environment, but rather internally generated pro-oxidants. While oxygen is essential for life, its use comes at a cost, as it poses a potential threat to biological systems. Accordingly, living systems require an entire system of compounds dedicated to neutralizing oxygen’s harmful effects. Photomicrograph of glutathione crystals, an important antioxidant and naturally occurring tripeptide composed of the amino acids glutamic acid, glycine, and cysteine. Specialized functional compartments within our cells utilize oxy-gen, in combination with other molecules, to generate the energy that powers many biochemical processes. Without oxygen, we could not exist. However, in the process of generating energy by “burning” nutrients with oxygen, certain “rogue” oxygen molecules are created as inevitable byproducts. Known as free radicals and reactive oxygen species, these unstable, highly reactive molecules play a role in cell signaling and other beneficial processes when they exist in benign concentrations.7 But when their numbers climb, as may occur as a result of aging and other conditions, they may wreak havoc with other molecules with which they come into contact, such as DNA, proteins, and lipids. As such, these “pro-oxidant” molecules become especially toxic. As another example, consider the visible effects of free radical damage to collagen, which forms the skin’s “scaffolding.” Healthy collagen is responsible for the skin’s elasticity and, to no small degree, its youthful appearance. As we age, internally generated reactive oxygen species gradually damage the molecular structure of collagen, eventually producing outward signs of aging such as skin wrinkling and sagging. For the first time, scientists at the University of Aarhus in Denmark have shown that SOD plays an important role in preventing this damage from occurring. Superoxide dismutase is arguably the body’s most crucial antioxidant, as it is responsible for disarming the most dangerous free radicals of all: the highly reactive superoxide radicals. Superoxide radicals, or anions (negatively charged atoms), are produced when oxygen gains an excess electron. This occurs through normal metabolic processes, such as the catalytic transformation of various molecules by enzymes. Efforts to boost SOD levels did not stop there, however. Turning to nature, scientists discovered that SOD and other primary antioxidants—like glutathione peroxidase and catalase—are produced by certain plants, including the sprouting seeds of crops such as wheat, corn, and soy. These young grains harbor an abundance of powerful antioxidants, which may serve to protect the fledgling plants from various environmental insults. Melons also manufacture some of these antioxidant proteins, and fruits with the highest concentrations of these beneficial enzymes have significantly longer shelf lives. Some plants produce SOD naturally. However, when SOD is ingested in the body, it is quickly destroyed by stomach acids and intestinal enzymes, and virtually no SOD enters the bloodstream. Fortunately, it is possible to boost levels of this important antioxidant by consuming supplements that supply concentrated amounts of appropriate precursor molecules. Wheat sprouts represent one rich source of these SOD-boosting building blocks, and have been shown to significantly increase internal antioxidant levels. Scientists have proposed that elevated levels of one form of glutathione, the enzyme glutathione reductase, may serve as a predictor of longevity.24,25 Falling levels of glutathione are associated with diseases such as AIDS, respiratory diseases and infection, osteoarthritis, Alzheimer’s, and even aging itself.26-33 Conversely, increased levels of glutathione are associated with improvements in these conditions. Wheat sprout enzymes are another source of bioactive plant flavonoids, and their potential benefits range from improving symptoms of fibromyalgia and joint pain to increasing energy and relieving symptoms of chronic fatigue syndrome. These benefits are likely related to the presence of several potent natural antioxidant enzymes, including superoxide dismutase (SOD), glutathione peroxidase, and catalase. SOD is a large molecule that, when orally consumed, is not readily absorbed by the body. However, technological advances have enabled scientists to bond SOD (extracted from a type of cantaloupe melon that naturally produces high levels of the enzyme) to a biopolymer extracted from ordinary wheat. Studies have shown that the wheat component, known as gliadin, protects the fragile SOD molecule from the ravages of stomach acid and intestinal enzymes, thus allowing the molecule to enter the bloodstream intact. Biosensor molecule.Computer graphic representation of superoxide dismutase enzyme (white) embedded in a matrix (sphere). The enzyme is acting as a biosensor. Biosensors are used to detect trace amounts of specific chemical substances such as metal ions. react with the enzyme, causing an observable color change (to blue). More recently, Japanese scientists studied the effects of oral SOD/ gliadin on tumor development in laboratory rodents. Gliadin alone, or the SOD/gliadin combo, was administered orally to test animals before and during experimental tumor induction. About 80% of gliadin-only subjects developed tumors, but only about half as many animals in the SOD/gliadin group did so. In the past, it was difficult to raise levels of these beneficial enzymes. Now, however, it is possible to bolster weakened antioxidant defenses with nutritional supplements that include orally bioavailable SOD and other primary antioxidants. 1. Regnault C, Soursac M, Roch-Arveiller M, Postaire E, Hazebroucq G. Pharmacokinetics of superoxide dismutase in rats after oral administration. Biopharm Drug Dispos. 1996 Mar;17(2):165-74.2. Vouldoukis I, Conti M, Krauss P, et al. Supplementation with gliadin-combined plant superoxide dismutase extract promotes antioxidant defences and protects against oxidative stress. Phytother Res. 2004 Dec;18(12):957-62.3. Vouldoukis I, Lacan D, Kamate C, et al. Antioxidant and anti-inflammatory properties of a Cucumis melo LC. extract rich in superoxide dismutase activity. J Ethnopharmacol. 2004 Sep;94(1):67-75.4. Muth CM, Glenz Y, Klaus M, et al. Influence of an orally effective SOD on hyperbaric oxygen-related cell damage. Free Radic Res. 2004 Sep;38(9):927-32. 5. Naito Y, Akagiri S, Uchiyama K, et al. Reduction of diabetes-induced renal oxidative stress by a cantaloupe melon extract/gliadin biopolymers, oxykine, in mice. Biofactors. 2005;23(2):85-95. 6. Umulis DM, Gurmen NM, Singh P, Fogler HS. A physiologically based model for ethanol and acetaldehyde metabolism in human beings. Alcohol. 2005 Jan;35(1):3-12. 7. Takeya R, Ueno N, Sumimoto H. Regulation of superoxide-producing NADPH oxidases in nonphagocytic cells. Methods Enzymol. 2006;406:456-68. 8. Barouki R. Ageing free radicals and cellular stress. Med Sci (Paris). 2006 Mar;22(3):266-72. 9. de Magalhaes JP, Church GM. Cells discover fire: employing reactive oxygen species in development and consequences for aging. Exp Gerontol. 2006 Jan;41(1):1-10. 10. Morrow JD. Quantification of isoprostanes as indices of oxidant stress and the risk of atherosclerosis in humans. Arterioscler Thromb Vasc Biol. 2005 Feb;25(2):279-86. 11. Faraci FM, Didion SP. Vascular protection: superoxide dismutase isoforms in the vessel wall. Arterioscler Thromb Vasc Biol. 2004 Aug;24(8):1367-73. 12. Fukai T, Folz RJ, Landmesser U, Harrison DG. Extracellular superoxide dismutase and cardiovascular disease. Cardiovasc Res. 2002 Aug 1;55(2):239-49. 13. Summers WK. Alzheimer’s disease, oxidative injury, and cytokines. J Alzheimers Dis. 2004 Dec;6(6):651-7. 14. Yu BP, Chung HY. Adaptive mechanisms to oxidative stress during aging. Mech Ageing Dev. 2006 Feb 21. 15. Petersen SV, Oury TD, Ostergaard L, et al. Extracellular superoxide dismutase (EC-SOD) binds to type i collagen and protects against oxidative fragmentation. J Biol Chem. 2004 Apr 2;279(14):13705-10. 16. Maier CM, Chan PH. Role of superoxide dismutases in oxidative damage and neurodegenerative disorders. Neuroscientist. 2002 Aug;8(4):323-34. 17. Fattman CL, Schaefer LM, Oury TD. Extracellular superoxide dismutase in biology and medicine. Free Radic Biol Med. 2003 Aug 1;35(3):236-56. 18. Chung JM. The role of reactive oxygen species (ROS) in persistent pain. Mol Interv. 2004 Oct;4(5):248-50. 19. Bae SC, Kim SJ, Sung MK. Inadequate antioxidant nutrient intake and altered plasma antioxidant status of rheumatoid arthritis patients. J Am Coll Nutr. 2003 Aug;22(4):311-5. 20. Shin SG, Kim JY, Chung HY, Jeong JC. Zingerone as an antioxidant against peroxynitrite. J Agric Food Chem. 2005 Sep 21;53(19):7617-22. 21. Zawadzka-Bartczak E. Activities of red blood cell anti-oxidative enzymes (SOD, GPx) and total anti-oxidative capacity of serum (TAS) in men with coronary atherosclerosis and in healthy pilots. Med Sci Monit. 2005 Sep;11(9):CR440-4. 22. Gow A, Ischiropoulos H. Super-SOD: superoxide dismutase chimera fights off inflammation. Am J Physiol Lung Cell Mol Physiol. 2003 Jun;284(6):L915-6. 23. Flohe L. Superoxide dismutase for therapeutic use: clinical experience, dead ends and hopes. Mol Cell Biochem. 1988 Dec;84(2):123-31. 24. Klapcinska B, Derejczyk J, Wieczorowska-Tobis K, et al. Antioxidant defense in centenarians (a preliminary study). Acta Biochim Pol. 2000;47(2):281-92. 25. Andersen HR, Jeune B, Nybo H, et al. Low activity of superoxide dismutase and high activity of glutathione reductase in erythrocytes from centenarians. Age Ageing. 1998 Sep;27(5):643-8. 26. Micke P, Beeh KM, Buhl R. Effects of long-term supplementation with whey proteins on plasma glutathione levels of HIV-infected patients. Eur J Nutr. 2002 Feb;41(1):12-8. 27. Micke P, Beeh KM, Schlaak JF, Buhl R. Oral supplementation with whey proteins increases plasma glutathione levels of HIV-infected patients. Eur J Clin Invest. 2001 Feb;31(2):171-8. 28. Bishop C, Hudson VM, Hilton SC, Wilde C. A pilot study of the effect of inhaled buffered reduced glutathione on the clinical status of patients with cystic fibrosis. Chest. 2005 Jan;127(1):308-17. 29. Carlo MD, Jr., Loeser RF. Increased oxidative stress with aging reduces chondrocyte survival: correlation with intracellular glutathione levels. Arthritis Rheum. 2003 Dec;48(12):3419-30. 30. Cho CG, Kim HJ, Chung SW, et al. Modulation of glutathione and thioredoxin systems by calorie restriction during the aging process. Exp Gerontol. 2003 May;38(5):539-48. 31. Junqueira VB, Barros SB, Chan SS, et al. Aging and oxidative stress. Mol Aspects Med. 2004 Feb;25(1-2):5-16. 32. Lothian B, Grey V, Kimoff RJ, Lands LC. Treatment of obstructive airway disease with a cysteine donor protein supplement: a case report. Chest. 2000 Mar;117(3):914-6. 33. Vina J, Lloret A, Orti R, Alonso D. Molecular bases of the treatment of Alzheimer’s disease with antioxidants: prevention of oxidative stress. Mol Aspects Med. 2004 Feb;25(1-2):117-23. 34. Lorenz K. Cereal sprouts: composition, nutritive value, food applications. Crit Rev Food Sci Nutr. 1980;13(4):353-85. 35. Marsili V, Calzuola I, Gianfranceschi GL. Nutritional relevance of wheat sprouts containing high levels of organic phosphates and antioxidant compounds. J Clin Gastroenterol. 2004 Jul;38(6 Suppl):S123-6. 36. Calzuola I, Marsili V, Gianfranceschi GL. Synthesis of antioxidants in wheat sprouts. J Agric Food Chem. 2004 Aug 11;52(16):5201-6. 37. Peryt B, Miloszewska J, Tudek B, Zielenska M, Szymczyk T. Antimutagenic effects of several subfractions of extract from wheat sprout toward benzo[a]pyrene-induced mutagenicity in strain TA98 of Salmonella typhimurium. Mutat Res. 1988 Oct;206(2):221-5. 38. Peryt B, Szymczyk T, Lesca P. Mechanism of antimutagenicity of wheat sprout extracts. Mutat Res. 1992 Oct;269(2):201-15. 39. SAS Release 32.3 at the University of Hawaii (01335001) by Environmental Health Associates. Keith M. Burchett, Director, Research Division. 40. Okada F, Shionoya H, Kobayashi M, et al. Prevention of inflammation-mediated acquisition of metastatic properties of benign mouse fibrosarcoma cells by administration of an orally available superoxide dismutase. Br J Cancer. 2006 Mar 27;94(6):854-62. 41. Benedetti S, Lamorgese A, Piersantelli M, Pagliarani S, Benvenuti F, Canestrari F. Oxidative stress and antioxidant status in patients undergoing prolonged exposure to hyperbaric oxygen. Clin Biochem. 2004 Apr;37(4):312-7. 42. Dennog C, Radermacher P, Barnett YA, Speit G. Antioxidant status in humans after exposure to hyperbaric oxygen. Mutat Res. 1999 Jul 16;428(1-2):83-9. 43. Andriollo-Sanchez M, Hininger-Favier I, Meunier N, et al. Age-related oxidative stress and antioxidant parameters in middle-aged and older European subjects: the ZENITH study. Eur J Clin Nutr. 2005 Nov;59 Suppl 2S58-S62. 44. Levin ED. Extracellular superoxide dismutase (EC-SOD) quenches free radicals and attenuates age-related cognitive decline: opportunities for novel drug development in aging. Curr Alzheimer Res. 2005 Apr;2(2):191-6. 45. Sampayo JN, Gill MS, Lithgow GJ. Oxidative stress and aging—the use of superoxide dismutase/catalase mimetics to extend lifespan. Biochem Soc Trans. 2003 Dec;31(Pt 6):1305-7.